The Critter Squad Wildlife Defenders are a special group of human and animal friends who work together to protect animals and save the planet. Each CS Wildlife Defender protects their unique home and has the skills to teach everyone to do the same! Critter Squad Wildlife Defenders evolved in the beginning of 2017 in Los Angeles, CA. Founder Geoffrey Mantonya had long been thinking of ways to take his already established Critter Squad global. Before our evolution to Critter Squad Wildlife Defenders, Critter Squad was operated for 13+ years before making the switch. With the world switching to a digital and global setting, Critter Squad decided to step-up to the plate as a global educator. With great teachers, amazing animals, a large fan base and one of the greatest cities in history, we are ready to take Critter Squad Wildlife Defenders GLOBAL! Anyone can be a defender of wildlife and the Critter Squad Wildlife Defenders are here to show you how! Critter Squad Wildlife Defenders strive to grow an appreciation for all wildlife through hands-on and digital education. We believe that conservation starts with education and learning to appreciate things we don’t understand is vital to preserving the planet. Help the Critter Squad Wildlife Defenders, defend wildlife! 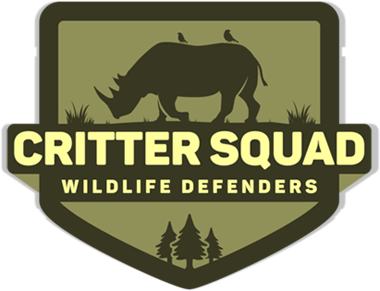 Critter Squad Wildlife Defenders WILL DONATE $10.00 from every booking to wildlife conservation and habitat restoration! We choose 6 non-profits a year to be our select organizations to get Defender Dollars! Don’t wait, book TODAY!